HP hasn't had many shots at making tablets yet. Their previous release, the Slate 7 was rather disappointing, but I must admit I felt excited when they announced their 10-inch Tegra 4-powered, Full HD Android tablet/notebook hybrid. It was especially exciting for me to see that both the tablet and keyboard would sell for a reasonable $479.99 price tag. Unfortunately, though, the SlateBook x2 turned out to be good only in theory, because while the device looks great on paper, it turned out to be plagued by so many design flaws it ruined my expectations for the device, making it not worth the $480 price tag. 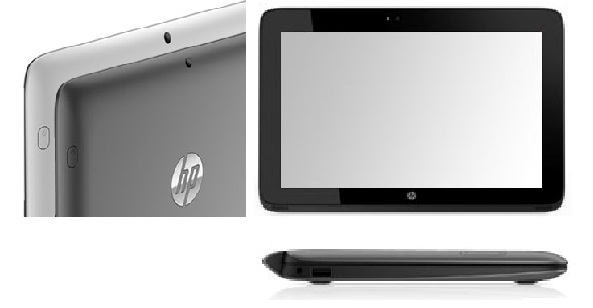 I actually quite like the industrial design HP used here. The back of the tablet is made of a nice-looking plastic, and is available in two shades of grey (* wink *), light and dark grey. A rather large Hewlett-Packard logo is etched on the center, and on the top-center of the back is the 1080p-capable rear camera. HP did a rather odd thing here: they opted to place the power button and volume rocker at the left and right edges of the back of the device. This makes the buttons considerably easier to reach when you're holding the tablet in landscape, but it still looks a bit awkward. On the front, the 10-inch 1920 x 1200 display is surrounded by not too large nor too narrow bezels. I actually think that this is the ideal bezel size for a 10-incher. Above the display is the 720p-capable front-facing camera and the ambient light sensor. Below the display is a small, centered HP logo (why do OEMs usually insist on putting two logos on their devices? ), and below it, on either edge of the device is a speaker grille. Overall, I like their design language, at least for the tablet only. Every once in a while I review a device, and I see design flaws that are so obvious that I realize how little effort some OEMs make to produce a decent product. The SlateBook x2 is once such victim of its OEM's carelessness, because when you dock the tablet into the keyboard, the microSD card slot and the headphone jack become inaccessible, because the dock connector is in the same side of the tablet as these two ports. You can probably get past the microSD slot's positioning quite easily, but c'mon, I'd like to be able to plug in my headphones and have the keyboard docked at the same time. Additionally, the speaker grilles, also located on the bottom end of the tablet, also get hidden when the keyboard is docked. Thankfully, this doesn't affect the sound quality too much, but come on HP, it's common sense. However, the keyboard dock is otherwise well designed. It looks nicely crafted, and the multi-touch pad is slightly wider than what we usually see in 10-inch keyboard docks. Typing on it should feel more or less the same than it would on any other 10-inch hybrid (cramped, but still usable). HP didn't offer any numbers on weight and thickness of the tablet only and, probably to emphasize that the dock is an essential part of the product, only gave us the numbers referring to the tablet plus the dock. With the dock on, the device weighs an OK 1.29 kilograms and is relatively thin, at 0.81". On paper, you'd think the device's display is pretty good. After all, the LED-Backlit 10.1 inch unit has a respectable resolution of 1920 x 1200 (224ppi). But the display's sharpness isn't the problem, it's the color accuracy that's way off. Basically, the SlateBook x2 can't reproduce anything close to white. When rendering web pages with white backgrounds, you'd see a distinct yellow tinge instead of white. And I'm not saying the display's white temperature is a bit warm, I'm saying it's a distinct yellow. The color inaccuracy basically ruins the display for most uses. Under the hood, the device is, again on paper, a very capable one. That's because the SlateBook x2 houses NVIDIA's state-of-the-art Tegra 4 SoC, accompanied by 2 GB of DDR3L-1600 RAM. If you don't know/remember, the Tegra 4 is a 28nm SoC consisting of a quad-core ARM Cortex-A15 CPU clocked at 1.9GHz (this tablet is limited to 1.8GHz though), plus a power saver Cortex-A15 companion core which is limited to 825 MHz and is designed to handle light tasks, increasing battery life. The powerful CPU is accompanied by an equaly powerful 72-core GeForce GPU and dual-channel DDR3L @ 1899 MHz. With such powerful specs, you'd expect the SlateBok x2 to be blazing fast, but if Android Jelly Bean and Project Butter taught me something, is that software is as important as the hardware for a device's speed, and the SlateBook x2 further proves that, because despite having a very capable processor, the tablet still feels slow at times. For example, apps take longer than usual to open. If it's not a software issue, I'd say that the problem is slow storage transfer rate (they were rather mediocre in benchmarks). Gaming performance is not as bad in the SlateBook x2, as it can produce very similar benchmark results to other Tegra 4 devices (the NVIDIA Shield is still ahead, though, probably because it has a cooling fan), hence gaming performance shouldn't be a problem, especially at 1080p (Tegra 4 can handle 2560 x 1600 resolutions well, so it can handle 1080p even better). The SlateBook x2 runs on stock Android 4.2.2 (the only customization is a couple of HP ultilities installed). The $480 price will get you the tablet, the keyboard, and 16 GB of storage (expandable through the microSD card slot). I think its nice that the $480 price tag is for the keyboard included. 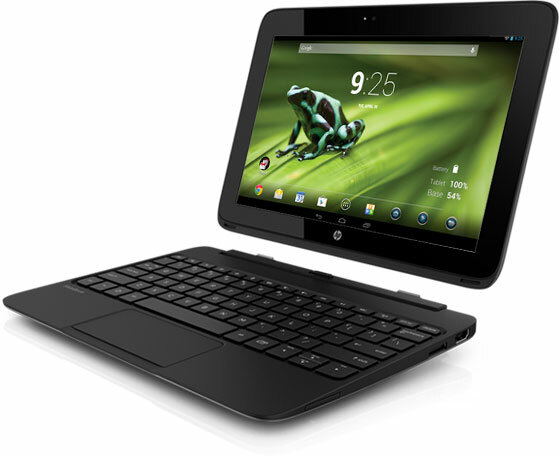 But still, the truth is that HP's tablet has potential; it has a crisp screen, a nice looking industrial design, just about the fastest SoC available and that useful keyboard dock, but it has so many design flaws that ruin the user experience of the device. The saddest part is that these flaws are very obvious and pretty easy to remedy, which shows that HP didn't care much about making the device good. Due to its flaws I strongly recommend other tablets at the same price point, even if they don't have a keyboard dock included, for example the Sony Xperia Tablet Z, the iPad 4 or the even cheaper Google Nexus 10.